If business or pleasure or any other reason ever requires Mike Lauen to visit Roseau, he would be wise not to mention his name. Or whisper a word about hockey. In the late 1970s Roseau was the state’s most renowned high school team. The Rams boasted a magical forward line of score-at-will brothers Neal and Aaron Broten joined by another extraordinary rink rat in Bryan “Butsy” Erickson. In 1977 and ’78 Roseau won its six Region 8 playoff games by a combined score of 45-8. Both years the Rams were 23-0 entering the state tournament. They were Minnesota’s small-town hockey darlings. The only problem with Roseau back then was Edina East. The Hornets, with hounds-tooth-hat-wearing coaching icon Willard Ikola behind the bench and line after line of big, strong, fast forwards supported by a fleet of tough and talented defensemen, also were in dynasty mode. Like Roseau, the Hornets made three straight state tournament appearances from 1977-79. All three years Edina East knocked the Rams out of the tournament’s winner’s bracket. 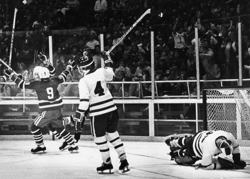 Lauen was just a sophomore in 1977 when Edina East completed the first leg of its beat-Roseau hat trick by upending the Rams 2-0 in the quarterfinals. In 1978, Lauen’s three goals and an assist propelled Edina East to a 5-3 semifinal triumph over Roseau in what still is considered one of the fastest-paced games in state tournament history. In 1979 it was more of the same, as Lauen notched three goals and an assist as the Hornets bombarded Roseau 12-4 in the semifinals. Lauen was much like the Brotens in that he honed his skills as a kid all but living on a frozen neighborhood pond. Lauen said he would spend 10-hour days playing shinny hockey during winter weekends. During the 1979 championship game against Rochester John Marshall, Lauen scored in overtime to secure the title for Edina East. His goal came in typical fashion. A dragster roaring up and down the right wing, Lauen possessed a heavy shot and thirst for driving to the net. On his title-winning goal, Lauen unleashed a wicket shot that sailed high over Rockets goaltender Paul Butters. Lauen ended up crashing into the end boards at the conclusion of the play, cutting his chin on his facemask and making for a somewhat bloody but no-less-joyous championship celebration. During Edina East’s 1978 championship thriller with Grand Rapids, Lauen took a hard spill into the boards and was knocked out of the game. Tom Carroll took Lauen’s place on the Hornets’ top line and eventually scored in double overtime. Lauen finished with 12 points in his three state tournament appearances. All three years the Hornets reached the title game (they lost to Rochester John Marshall in 1977). Mike Lauen, who starred at Michigan Tech and briefly in the NHL for the Winnipeg Jets, lives and works in the Twin Cities. 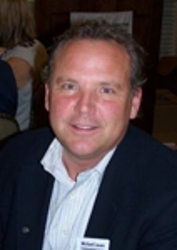 Lauen, who lives in the Twin Cities and is the senior vice president of management services for Donnelly Property Management Group, was a leading scorer at Michigan Tech and also put up big point totals as a minor leaguer playing in the Winnipeg Jets’ farm system. Lauen played four games in the NHL with the Jets in 1983. In his pro debut, Lauen’s line was matched up against none other than the Edmonton Oilers’ trio of Wayne Gretzky, Jari Kurri and Dave Semenko.